Often sidelined as quackery, herbal medicine pre-dates its modern Western counterpart by thousands of years, and to raise awareness and highlight the importance of herbalism, this week is Herbal Medicine Week. Many pharmaceutical drugs owe their origins to botanical extracts and ancient herb wisdom. 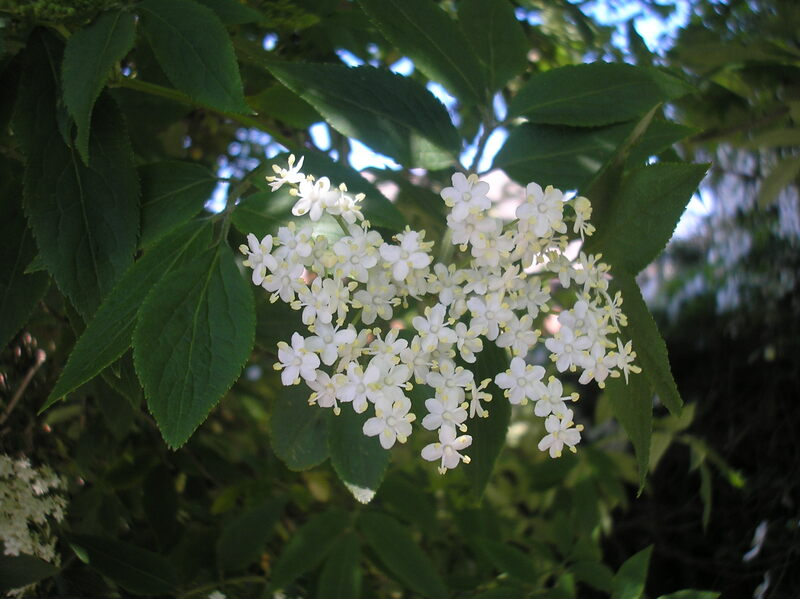 For centuries, white willow bark and meadowsweet were used to treat rheumatic pains; plants which were later discovered to contain salicylic acid, heralding the invention of aspirin. Foxgloves, once a common folk remedy to treat heart problems, are now known to contain digitalis and an extract called digoxin which is still used for cardiac complaints. Even as I write, plants are being scientifically researched and tested to find new pharmaceutical cures. 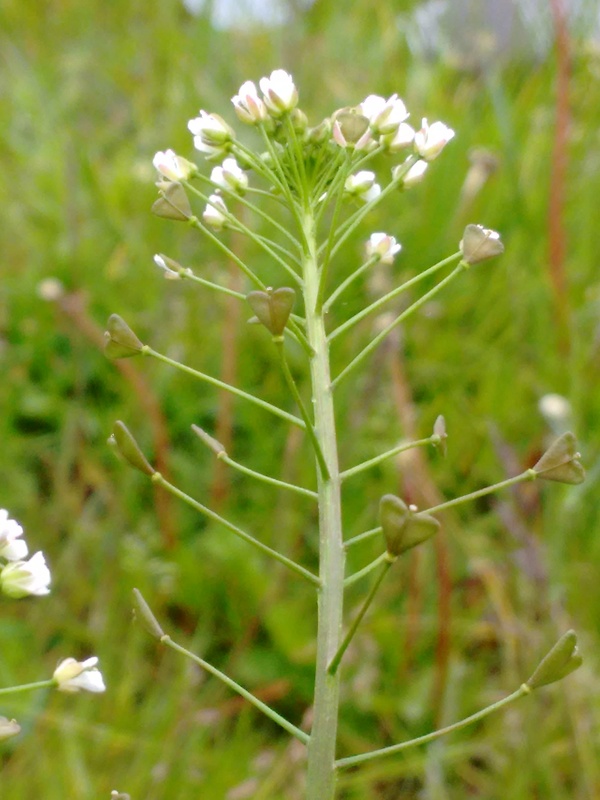 While investigating a wild herb I often discover an associated ‘old wives tale’ which has later been substantiated in the lab. It is therefore foolhardy to think that drugs companies and Western medicine alone have all the answers. 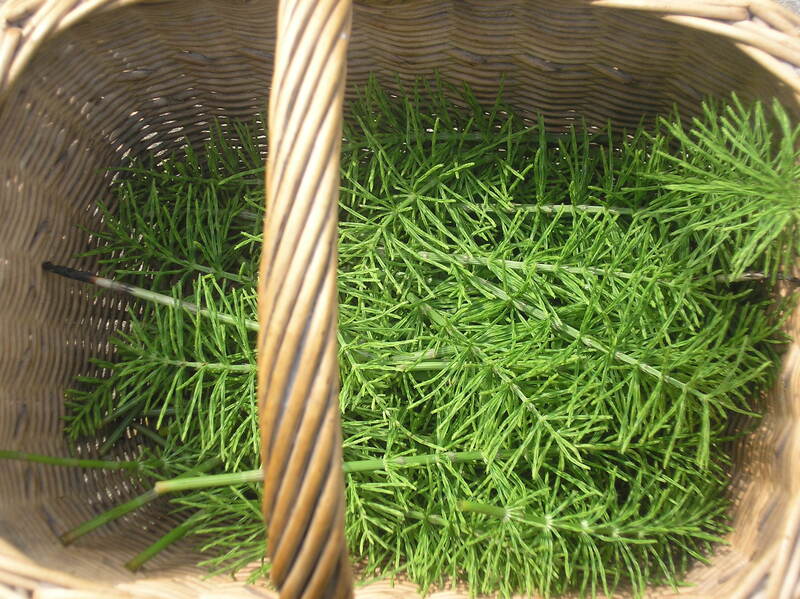 I turned to herbalism to treat an illness for which doctors currently have no cure, and I think that many people come to natural remedies as a final option. But are we mistaken to have this ‘last resort’ attitude towards herbal medicines? Perhaps we form this opinion because it has gained an unfair reputation over the past 50 years as a woolly discipline, championed by ‘hippy dippy’ types. During the Second World War, Britain relied on medicinal drugs made almost exclusively from our own wild plants. Maybe if we considered facts like this we would begin to regard herbalism as the originator of healing medicine and start to make herbal remedies our first port of call instead of our last. Perhaps, like post-war Britain, we would be healthier with bodies that could heal themselves in contrast to the modern lifestyle of pill-popping. A visit to a herbal practitioner is rarely a quick fix but it is a holistic one, tailored exactly to your body’s needs, as opposed to a ‘one pill cures all’ approach. From personal experience, herbal remedies do work and even though I am already a convert I continue to be amazed by the power and healing properties of plants. As any dedicated forager will know, this time of year is superb for harvesting free goodies, and not just edible ones. After months of inactivity Mother Nature has gone barmy with her usual late Spring/early Summer gusto and there is now an abundance to choose from. 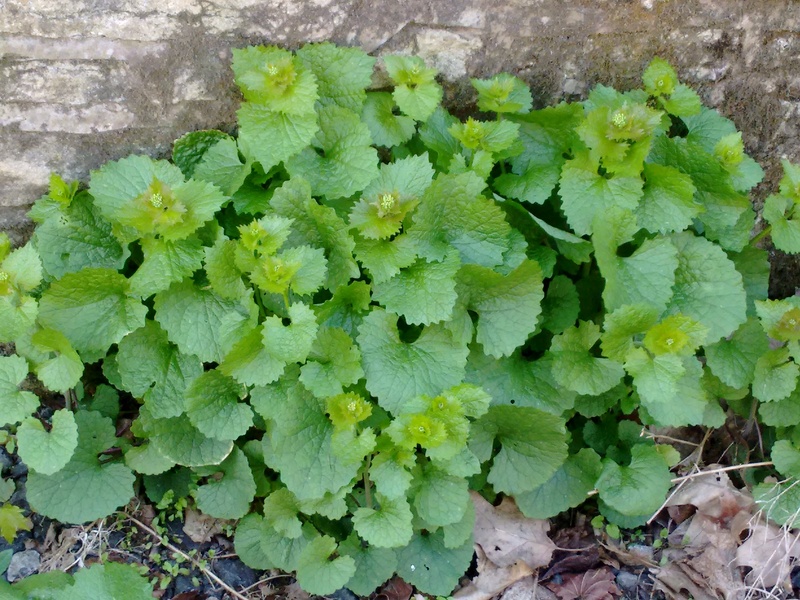 A few of my favourite edibles at this time of year are tangy treats like Jack in the Hedge sometimes aptly known as Garlic Mustard. Just as the last of the Wild Garlic dies back, Jack in the Hedge is still at its best with a strong garlicky mustard flavour, delicious in salads, on sandwiches or mixed into mayonnaise to add pizazz. 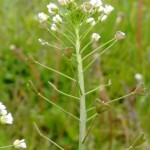 Similarly punchy is Shepherds Purse – with its almost acrid little seed pods and peppery leaves, it imparts a pure wild mustard bite to any dish. 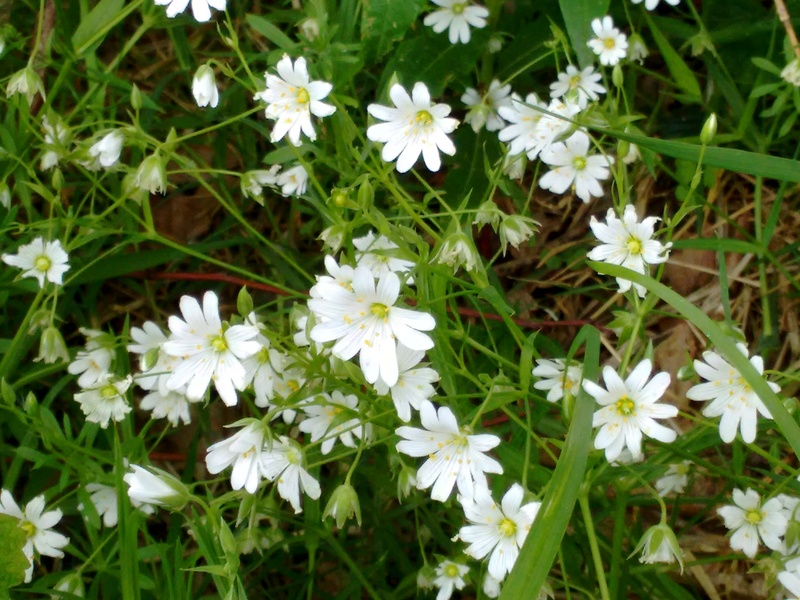 Perhaps less intense is the easily overlooked Chickweed, currently growing in almost any environment from country parks to car parks. This tiny weed has a freshly shelled pea taste which is pleasant but unremarkable. However, it is well worth eating as it packs an astonishing array of nutrients including vitamins A, B6, B12, C and D plus iron, potassium, calcium, silica and zinc. 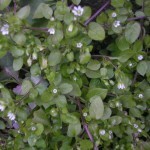 Chickweed is also a detoxifier and blood cleanser and has a reputation as a weight-loss herb. 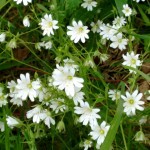 Its larger and showier country cousin, Greater Stitchwort (so named as it was believed to remedy a stitch) is also worth a try. It has an equally pea-like flavour with the added bonus of larger white flowers which look gorgeous in summer salads. Boil the water then add the lemon juice and zest. Continue to simmer for a further 10 minutes then remove from heat. 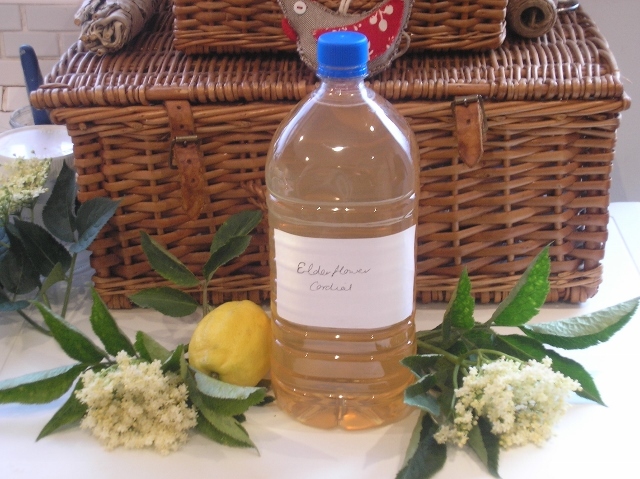 Immediately drop the Elderflower heads into the boiling water, cover and allow the flavours to infuse for at least 24 hours. Once thoroughly steeped, strain the liquid through a muslin cloth and return to a clean pan. Bring to the boil then add the sugar. Once it has dissolved, boil for a further 10 to 15 minutes, then pour into pre-sterilised bottles, allow to cool, then seal. To drink, dilute 1/3 cordial to 2/3 water. I’d like to be able to tell you how long this keeps but unfortunately it never lasts long enough for me to find out. 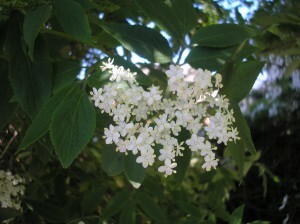 Elderflowers were also once used in a variety of domestic ways, particularly as an ingredient in homemade beauty treatments. It seems the flowers have a mild bleaching quality so they were believed to remove skin blemishes. Although this is highly unlikely my next recipe is perhaps best avoided by those with fake tans. 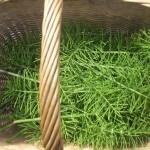 Heat the olive oil in a pan until you hear it bubble, then take the fresh Horsetail and drop it into the hot oil. Remove it from the heat immediately to avoid the herb ‘cooking’. 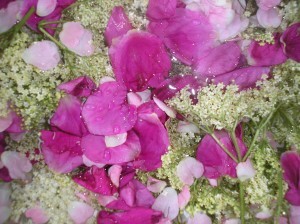 After 5 minutes drop the Elderflowers (plus the optional Rose petals) into the oil and allow them to infuse. Once the mixture has cooled for 15 minutes strain through a sieve and some muslin into a bowl. Throw the drained herbs away (or on the compost) and wash the pan. Return the oil back to the clean pan and reheat. Drop a quarter of a bar of beeswax into the oil and allow it to melt. As soon as it has disappeared remove from the heat. While it is still warm pour into the sterilised jar, covering the top with muslin until it sets. Once completely cooled screw the lid on and store in a cool dark place where it should last for a couple of years. Refrigerate once opened. This recipe makes one jar, increase quantities as required. 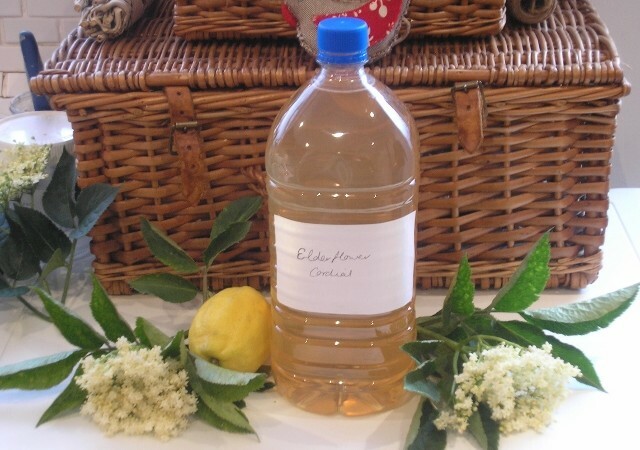 Elder has so many uses but the most practical summertime use involves leaves which omit a chemical odour that naturally deters flies and midges. By popping a leaf in your sun hat or hanging a small branch by your door you will repel most bitey and buzzing beasties. I tested this out last summer with excellent results. DISCLAIMER: These are some of my personal experiences of using the above herbs combined with information I have researched over a number of years. I am not encouraging people to self-medicate. In the treatment of specific conditions it is best to consult a herbalist or your GP. Always check if any pharmaceutical medication you are taking is compatible before trying herbs. If you should develop an adverse reaction to any of the herbs mentioned above then please stop using them immediately. 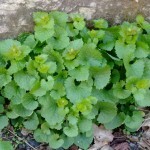 Always take care when identifying plants.